Pain often occurs when one of the facet joints that link the vertbrae in your spinal column is suddenly twisted or jerked. A joint that is damaged in this way may stick or “lock”, making movement difficult as well as painful. 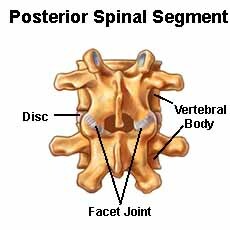 Facet joint strain can occur throughout your spine. Awkward twisting or bending of your neck or back can injure the ligaments, muscles, or the capsule of a facet joint. Whiplash from a car accident is a good example of this type of injury, but it can also result from failure to warm up before exercising or playing sport, or from lifting heavy objects. Even simply turning over in bed or sleeping awkwardly can have the same effect. Your muscles may then go into an uncontrollable spasm, making the joint stiff and immobile. Facet joints are more vulnerable to strains from middle age onwards, when osteoarthritis may flare up, the discs in your spine have degenerated significantly, and the ligaments that are supporting the joints become more slack. In the early stages, disabling pain in you neck or back is often accompanied by restricted movement. Pain from facet joint strain in your lower back may also radiate into your buttocks, hips, lower abdomen, and thighs. Movement may be limited for only a few weeks; however, it can last for months, and in some cases years, unless you receive appropriate treatment, which usually involves manipulation or, in chronic cases, an injection. Facet joint strain in your neck may extend down to your shoulders, making it difficult to bend your neck or turn your head. Your doctor will make a diagnosis by giving you a physical examination. There is no serious risk from facet joint strain, but failure to relieve pain or inflammation can lead to permanently stiff joints. Joint strain in the middle of your back, although the least common, may cause pain to radiate around your chest, making it painful and difficult to breathe, especially if the joints between the ribs and thoracic vertebrae become “locked”. Call +65 64712674 for an appointment to treat Facet Joint Strain today.